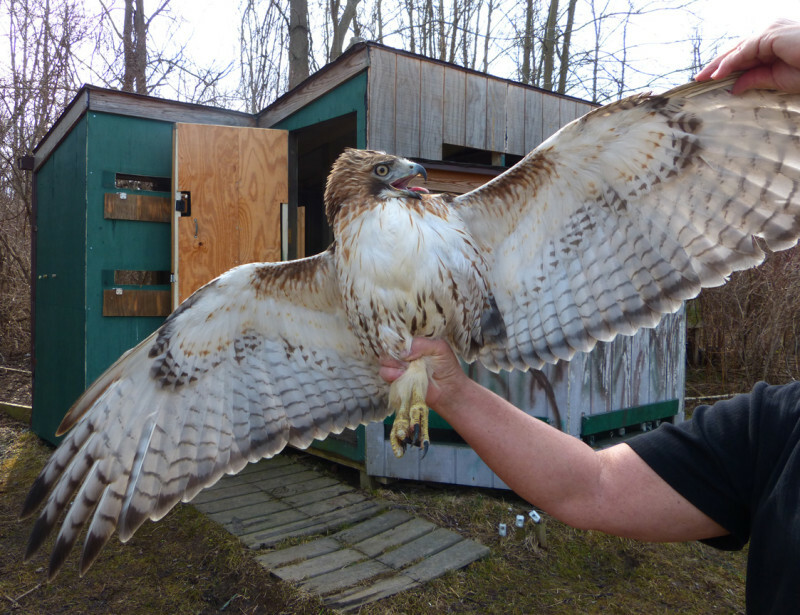 Raptor Banding Update – What a difference a year makes! Last year, Susie Cotsworth and I opened Main Blind in the Owl Woods late in March – and we had to dig out a trench in the snow to run lines to the traps. We froze nearly to death on many of those early days! A frozen lake and ripping lake effect winds kept us chilled and the birds away until well into April. This year, on Tuesday, March 8th, Dan Niven, Susie and I, with the help of Susie’s wonderful husband Tony, opened Main Blind amidst temperatures in the mid-50s, overcast skies, and warm, mild winds. While the field was pretty wet and squishy, little to no snow was in sight. As opposed to bundling up in long underwear, mittens, hat, and hand warmers, I was out this year in a short-sleeved T-shirt installing traps. Joined later by banding trainee Jim Saller, we installed four bow nets and got two fully rigged with lines, returned our cans and tools to the blind, and got everything organized for what we hope to be a much more successful spring hawk banding season. Daena Ford stopped in to deliver needed paperwork and much-appreciated Girl Scout cookies for those who had ordered them, as well as to handle a few items of business. What we didn’t see were hawks. The promised southwest winds never materialized, replaced instead by light northeastern winds. Geese, swans, and gulls teased us, but we didn’t see our first raptor until Dan spotted a Turkey Vulture on our way to our traditional after-banding lunch at Jo’s Diner. However, the next day (Wednesday, March 10th) was much more productive. 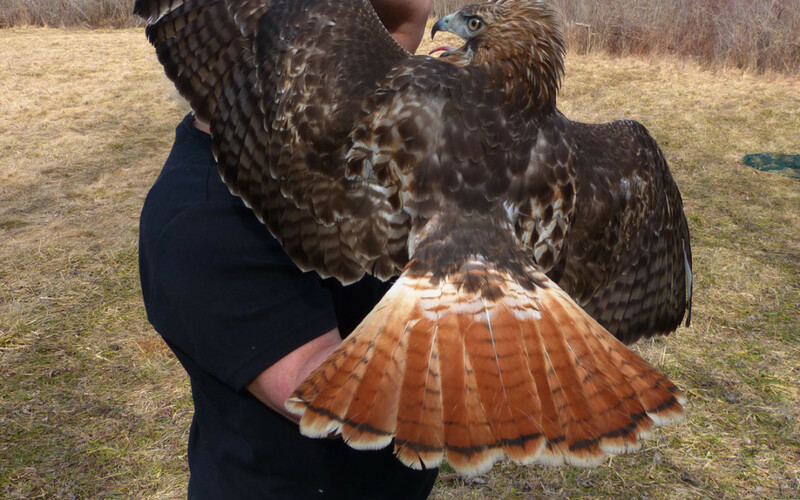 Susie and I saw far more birds than we caught – many Red-tailed Hawks, two nice Rough-legged Hawks, one American Kestrel flitting his way across the field, and several Red-shouldered Hawks, including one so gloriously bold and bright it took our breath away! Visitors were present to see three of our four birds banded that day, all Red-tailed Hawks – two adults and two 2015-hatched juvenile birds. Saturday (March 12th) looked decent on paper, but a combination of cold, light winds and blue skies sent the birds too high to attract down to earth. One beautiful full-adult Bald Eagle, with glowing white head and tail, graced us with a lower look as it sailed around in the station. Susie and I put the down time to good use to finish running the lines on a third bow trap, so we now have three traps fully operational. Next week will be too rainy for a lot of action, but we’re hoping to get out again when the skies clear up! You all are WONDERFUL! Thanks for doing what you do!